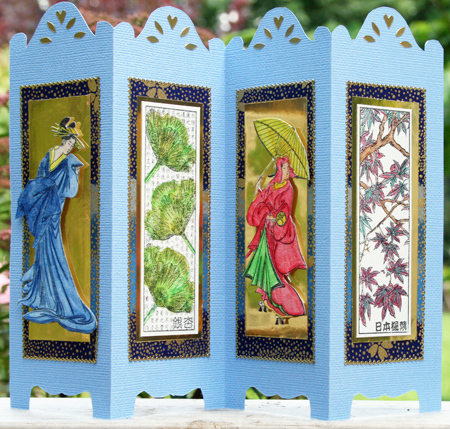 For about 2 years, have been making cards for about 13 years but mostly 3 D decoupage and paper embroidery. I love doing watercolor and alcohol ink backgrounds. At the moment green, purple, red, black and gold. But that can change any time. Only thing I can think off at the moment is make sure you cut straight. I think it’s elegant and mystical. 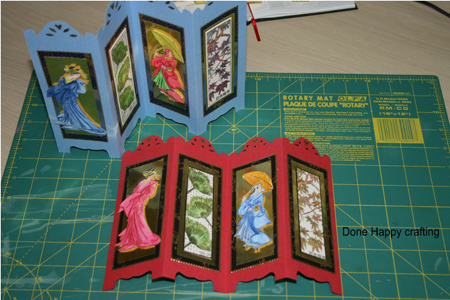 We don’t have any local card making groups so I have to have it from the internet. I belong to “Hand Made Cards With Care”. These girls got me in to stamping. “Asian influence and More” a Dutch group called ‘KinpGedoe” and “Us _ Can_ Craft”. All the other ones I belonged to I quit when I joined OSA. We have a lot going on here to keep me busy. Again, we don’t have any in my town. I just started getting VSN, which I really enjoy. No, I have never submitted anything. Lots of them. Besides card making I make wedding cakes, do photography, bake, cook, paint, crochet, swim, garden, fish, play games on the computer and spend lots of time with our grandchildren. Lots of things. It could be a color or a picture and for sure a challenge. I don’t know exactly what you mean, but I have stamped on glass, wood, and even fabric. I love going to “You tube”. At least I get to see how they do curtain techniques. Yes I do. I work at our local mall at a small restaurant in the food court 4 days a week and I baby sit 2 of our grandsons 5 days a week. 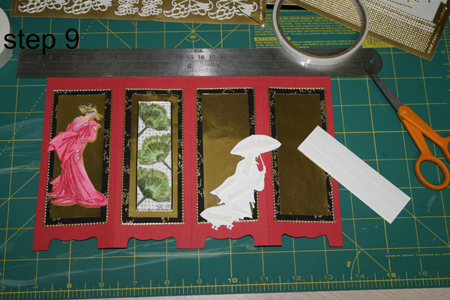 Hi, I am Monica, a self-proclaimed card-making nut. was born in the Netherlands and immigrated at the age of 2 with my parents to Canada. We lived in Swift Current, Saskatchewan. After my dad got very sick we went back to the Netherlands in 1960 when I was 9. At the age of 16 I married my dear hubby Tony. We are married 41 years this year and still nuts with each other. 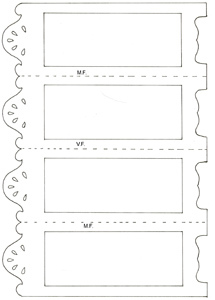 October 2009 – Monica H.
I use cheap card stock and save template for later use. 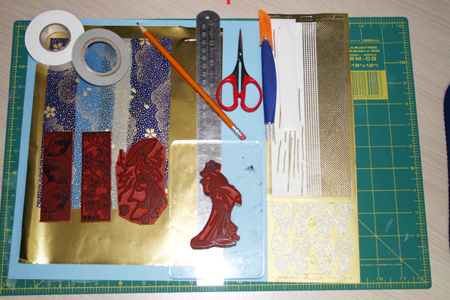 Lay template on your card stock and trace the out side lines. 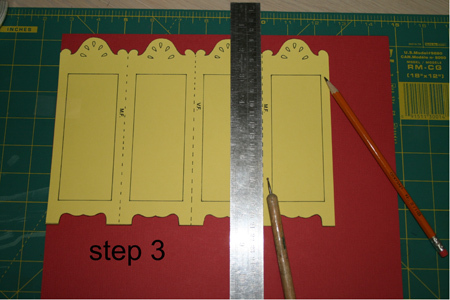 Cut out 1 panel from your template as a guide line to use to make 4 panels for your card. On the red card I used wrapping paper. 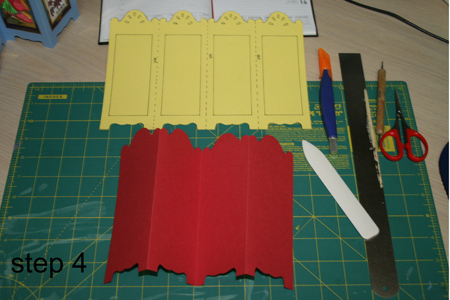 Cut 4 more panels about a ½ inch smaller all around adhere on top of first panel. 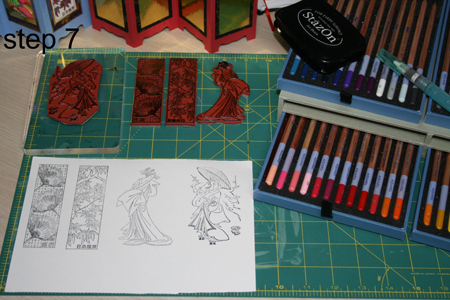 Now we get to stamp, I used jet back Stazon to stamp on my water color paper and Sakura water color pencils to color my images. All stamps used are from StampMagick . 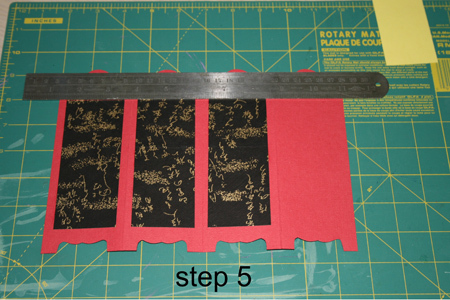 If you want to use peel off edging now is the time to put it on. 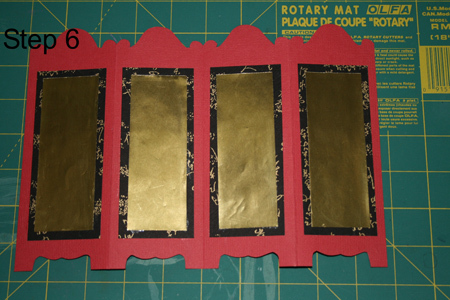 Finish off your screen card by either adding small stickers on the 4 tops of your screen card or use small jewels or if you have a tiny punch use it. Card is Done! Hope you enjoy making it.